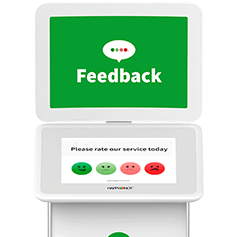 Our Smiley feedback solution makes capturing and analyzing feedback so easy, you save time and energy to focus on making measurable and successful improvements. Approachable, anonymous, and easy-to-use, our Smileys help you listen to your customers and employees in all business environments. Product availability may vary by market. Please contact us for details. 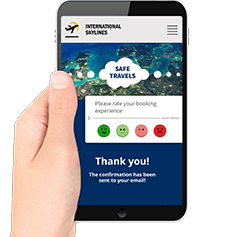 Our web-based Reporting Service helps you track and manage your performance by transforming your feedback into data analytics that are clear and actionable. Quick View gives you an instant overview of your key performance results summarized in easy-to-understand, informative widgets. Quick View helps you focus on the most important information, and save time getting it. With immediate access to your key performance status, you can make necessary improvement decisions faster and more effectively. Shows the status of key service performance data, at a glance, over a selected period. Displays the amount of happy and unhappy customers, to show how much room for improvement is possible. Visualizes the performance development, as the Happy Index or Negative Percentage, from a selected period to date. 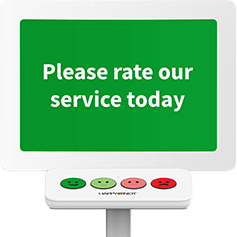 Analytics offers your feedback results in interactive charts and graphs, enabling you to research long-term trends and pinpoint exact times and places of service decline. The drill down functionality and data exporting gives you full control to analyze your past and current performance results, so you can make more informed improvement decisions for the future success of your business. Visualizes the percentage and total amount of responses, to give an immediate overview of participation and performance. Displays the results of all locations, from top to bottom performers based on the Happy Index, to show locations needing most support. Shows the amount of feedback and Happy Index, for every open hour of operations, to easily spot low performing hours.